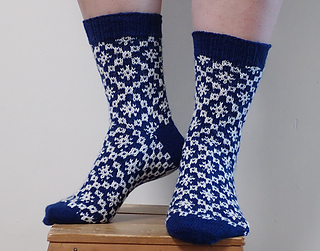 Baltic Princess (Baltian prinsessa) sock pattern was exclusive to the Finnish knitting club Kalakukkojen neuleklubi 2017 until April the 20th, 2017. Now the pattern is available free of charge for everyone on Ravelry. The design is a tribute to traditional Estonian stranded mitten patterns. The main stranded colorwork pattern is from Pärnu region and published in Suur kindaraamat by Reet Piiri. The instructions have been written for working cuff down but the symmetric pattern allows an easy transformation to working toe up. There is only one option for the stitch count (72 sts). Therefore the width of the sock can be adjusted only by changing the gauge.